The 2019 NDAA contains several provisions reforming commercial item contracting. As discussed below, these changes include: 1) revision of the definition of commercial items for purposes of federal acquisition statutes; 2) limitations on the applicability to U.S. Department of Defense (DoD) commercial contracts of certain provisions of law; 3) modifications to procurement through commercial e-commerce portals; and 4) review of federal acquisition regulations on commercial products, commercial services, and commercially available off-the-shelf items. 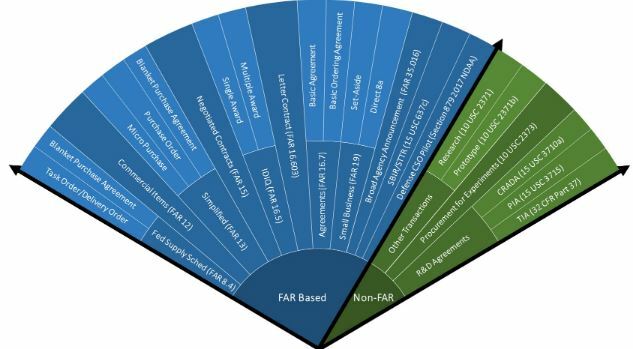 The “Contracting Cone” shows the full spectrum of available FAR and non-FAR contract strategies. Several federal acquisition statutes and regulations exist that impact commercial item contracting. The two most prominent examples are the Federal Acquisition Streamlining Act (FASA) and Part 12 of the Federal Acquisition Regulation (FAR). Before Congress passed FASA in 1994, many contractors did not conduct business with the U.S. government due to demanding terms and conditions and additional costs or risks associated with government specifications. FAR Part 12 establishes a mandatory preference for the U.S. government to purchase products and services available in the commercial marketplace using commercial terms and conditions. From time to time, Congress revises these statutes and regulations in response to shifts in policy considerations and market conditions. The 2019 NDAA works again to reform commercial item contracting. 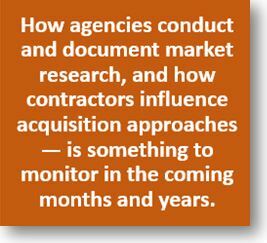 These revisions are important for government contractors operating in the commercial item contracting space to know. Last month, the Federal Circuit weighed in on a largely-overlooked provision in the Federal Acquisition Streamlining Act (FASA) that requires federal agencies, to the maximum extent practicable, to procure commercially available goods and services to meet their needs. In the case — Palantir USG v. United States — the court affirmed the decision by the Court of Federal Claims (COFC) enjoining the Army from proceeding with its Distributed Common Ground System – Army Increment 2 (DCGS-A2) procurement until it complies with the FASA provision. This bid protest decision has potentially significant implications for commercial item contractors. DCGS-A2 is not your average solicitation for an IT system. It is phase two of the Army’s flagship system for processing multi-sensor intelligence — a program that the Army has spent nearly two decades and billions of dollars trying to develop. For several years prior to the release of the DCGS-A2 solicitation, Palantir — the protester — informed the Army that the company already had a commercial item that Palantir believed fit the Army’s requirements. Despite Palantir’s communications regarding the capabilities of its product, the Army issued a single-source indefinite-delivery/indefinite-quantity solicitation focused on developing a new intelligence data management system — essentially from scratch. Palantir protested the solicitation and argued that it violated FASA’s mandate regarding the use of commercial items. Palantir USG v. United States may prove to be one of the most significant procurement precedents of the decade. Affirming the Court of Federal Claims, the Federal Circuit breathed new life into the government’s obligations under the Federal Acquisition Streamlining Act (FASA) to prioritize, to the maximum extent practicable, the acquisition of commercial and nondevelopmental solutions. Weaning agencies off their historic preference for developmental solutions is critical now more than ever, as it is readily apparent that maintaining the United States’ technological and battlefield superiority depends on its ability to harness technologies from the commercial sector and become a more commercial-friendly business partner. The decision will have the practical impact of requiring agencies to more carefully document their market research. Palantir will also provide useful leverage for companies seeking to eliminate (whether by negotiation or protest) solicitation provisions that are not accommodating to commercial vendors. One of the first — and even more than two decades later, still one of the most important — changes during the procurement reform era of the 1990s was the introduction of a “micropurchase” authority in the Federal Acquisition Streamlining Act of 1995. In the background was the desire to allow program customers the ability to use a government credit card to make very small purchases directly, without the significant extra time (think of the purchase order request landing at the bottom of the contracting person’s in-box) and administrative cost that come with working through the contracting office. An interesting backstory to this statutory change was the role of a young contract specialist at the Department of Health and Human Services named Michelle Craddock in helping develop the administration’s legislative proposal on this. Even before the 1995 law, the government could make purchases under $2,500 without going through a competition. 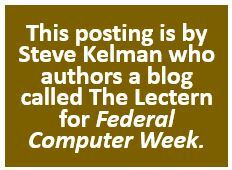 Having just arrived in Washington in 1993 to become administrator of the Office of Federal Procurement Policy, I was tasked with trying to find out if there were any statutory barriers to using a credit card for under-$2,500 purchases. On a learning tour of contracting offices to prepare me for my job as a Washington outsider awaiting Senate confirmation, Craddock was one of the contracting people I met in a visit set up by the HHS senior procurement executive. 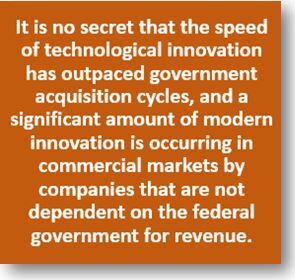 For decades Congress has demonstrated its deep interest in simplifying the federal government’s ability to buy commercial products and services. It recognized that to solve government’s most difficult problems, the government must have ready access to the innovative and rapidly evolving commercial marketplace. But the government’s transactions in the commercial marketplace, which should be quick and easy, have gotten more complicated over the years, not less so. This is due in large part to the volume and complexity of government-unique contract terms and conditions. Volume 1 of the Section 809 Panel report includes several recommendations for Congress’ consideration that will truly simplify contracts for commercial products and services. Among other strategies, Recommendation 2 makes the case for Congress retaining the authority to determine the applicability of new government-unique requirements that are well-intended but burdensome, rather than delegating that authority to the Federal Acquisition Regulatory Council or the Department of Defense. In 1994, the Federal Acquisition Streamlining Act took important steps to make the government more commercial-like in its dealings in the commercial marketplace. FASA limited the applicability of many, but not all, procurement-related statutes in two ways. First, many statutes in effect at the time FASA was enacted were made inapplicable to commercial buying, significantly simplifying federal contract compliance and administrative burdens.